I adore my garden, and on the whole, it makes me very happy. The positive comments many of you leave on my Bloom Day posts make me happy too, but I’d like to think that it wouldn’t bother me much if I got no comments at all, or even if I got negative comments about my garden’s design (or its lack thereof). I totally get that there are reasons for rules about proportions and flow and focal points and odd numbers and all of that if you’re creating a garden that you want other people to be comfortable in and find pleasing. But for those of us who garden simply for our own pleasure, I can’t see any reason to judge our success on how closely our gardens conform to the guidelines of “good design” – unless that’s the standard we want to use, of course. If you choose to plant what you like, where you like, without regard to the accepted standards of good design, you too will probably end up with what some people diplomatically describe as “well, it’s a very personal garden” – as opposed to, I guess, “a very interesting garden” (with lots of new or trendy or unusual plants) or “a very beautiful garden” (with lots of hardscaping and tasteful statuary and all that). I can find something to enjoy or admire in any garden I see, but for one I have to live in every day, I’d choose my somewhat rumpled, homemade hodgepodge over an immaculate, perfectly planned design any day. That’s not to say that all here is complete chaos. I do have a few standards I use to judge my own garden, but they’re pretty simple. I’m not a big fan of soft pink, but I really like burnets, so this one (Sanguisorba obtusa) found a place with some other lighter colors. I have some pretty strong (though not completely inflexible) ideas about which colors I like together and which I don’t. On the whole, it hasn’t been hard to work around those: I keep the most intense colors out front, the whites and blues toward the back of the side garden, and the softer yellows, purple, and pinks in between. It’s not a perfect system, but for the most part, it all works out. 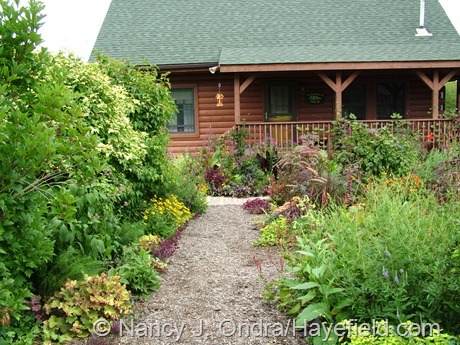 Front Garden at Hayefield (July 2011): Colorful foliage is also a key feature in this area. While my basic color choices have stayed pretty much the same since I started gardening, the kinds of plants I prefer has changed dramatically over the last twenty-plus years. I started out being interested in only rare, seed-grown species, then gradually changed to wanting all of the newest cultivars. Both of those approaches worked fine when I had limited space to work with. 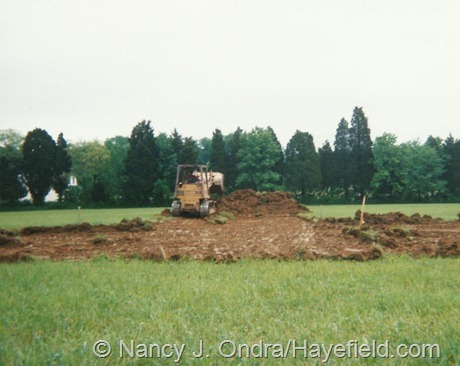 But when I started from scratch here at Hayefield, I had a whole lot of space to fill without much money to do it. These days, I don’t much care how rare or new or common or old-fashioned a plant is: if it grows well here and looks healthy and vigorous, I’m happy to have it. I can accept that not all perennials follow the “first year, they sleep; second year, they creep; third year, they leap” thing, but if they’re still sleeping by year three, not really dying, maybe, but not thriving either, they’re lucky to get one more year to either make a real effort or become compost. Sorry, buddy – you’re out of here! Most of all, what I really want is for my garden to be easy to take care of. That’s not to say I want a “low-maintenance” garden, in the usual sense of that term. I like spending time puttering around out there, and I enjoy the heavier labor involved in new projects too. Weeding, planting, seed-sowing, transplanting, and trimming are all perfectly fine ways to spend a life. Things I hate doing, and which I won’t do if I can all help it, include watering, mulching, staking, and worrying about pests and diseases. Over the years, I’ve developed a finely honed ability to overlook all but the very worst insect and disease problems, and I have no trouble getting rid of plants that are repeatedly infested or infected, so that’s not a big issue anymore. And, wonderfully, the other boring chores are pretty much a non-issue too – not as a result of any specific actions on my part, but as a side effect of doing the things I most like to do: the “editing” that balances the growth of the plants so each has enough room to thrive and shine without additional input from me. Plant spacing isn’t something most of us specifically think about as an on-going issue in the garden. Theoretically, if we do our homework and set out the plants correctly at planting time, allowing each one the amount of space the book or plant tag suggests, then we shouldn’t have to think about it again, right? The Viburnum Border at Hayefield (September 2010): No room for annuals any more! It took me quite a while to figure out that the overall disappointing results in my very first gardens weren’t because I hadn’t prepared the soil well enough, or chosen the right plants, or taken good care of them. It’s because I followed those spacing guidelines literally, without really looking at the plants themselves. If the experts said that a plant grew 4 feet wide, I left that much space empty around it – and then I had to weed continually to keep the little guy from getting smothered, or else pile on the mulch around it to keep its space weed-free. Either way, I still had to look at a tiny sprig of a thing surrounded by a lot of empty space for several years. Even when the plants reach the size they are supposed to in a timely manner, the results aren’t very satisfying. 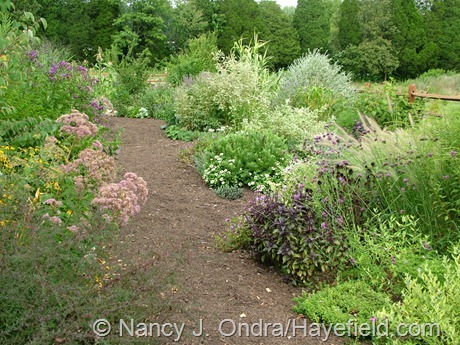 If a perennial grows 2 feet wide and you surround it with other perennials that grow 2 feet wide, and you set their centers exactly 2 feet apart, they eventually touch at the edges and cover the ground. In the meantime, though, there’s empty space around them, which needs to be weeded and/or mulched. Clearly, this whole spacing thing was a lot more complicated than I thought. 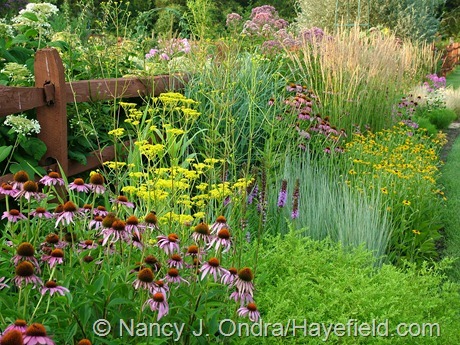 As I visited other gardens and paged through every book and gardening magazine I could get, I realized that I was most drawn to the pictures where the plants looked happy together: each with enough space around it to fill out but close enough that it touched its neighbors. Low spreaders pooled around the base of more upright companions, fountain-shaped clumps arched over bushy or mounded bedmates, and tall plants leaned gently on each other or on shorter ones, all with the effect that the ground was completely covered but the plants didn’t look like they were smothering or being smothered by their companions. By looking at pictures of combinations I really liked, and by watching how my plants interacted when they seeded or spread into places I wouldn’t have expected them to fit, I gradually realized that the shape of each plant is just as important as its ultimate size. 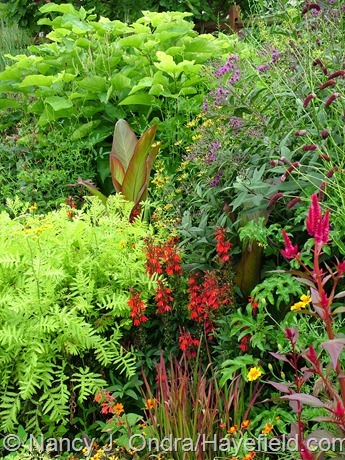 Combining complementary shapes lets you pack a surprising amount of plants into a small amount of space, producing that amazing layered look without having to cage or tightlace the taller or bushier plants, and without having to buy and spread huge loads of mulch to keep the ground covered and cut down on weeding. Now, being able to cram loads of plants into a given amount of space is great when you have an established garden and are fine-tuning combinations, or if you can afford to sink hundreds or thousands of dollars into buying enough plants to create an instant garden. 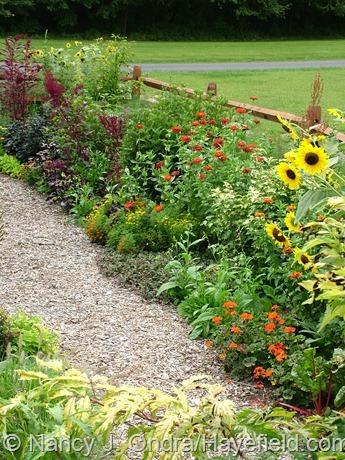 But what if you’re starting a new garden from scratch, and with limited resources? The Side Garden at Hayefield (June 2003): Time to get rid of the grass! 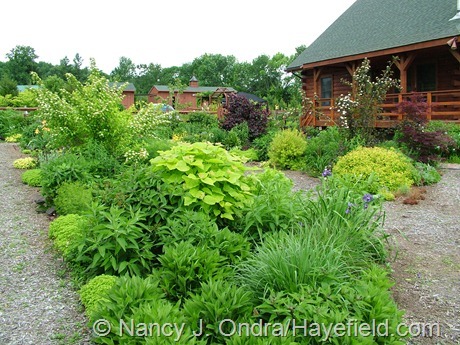 The strategy I used for most of the plantings here was to begin with some shrubs, add some sturdy perennials, and then fill in with inexpensive annuals. Over time, I’ve developed a list of easy, dependable plants that I count on for filling new garden spaces. I’ll put them in Part 2 of this post, along with some more random thoughts about planning and planting. Thank you for your good advice, which I will tell my husband about. He is teasing me that I don´t live after what I preach! I always tell other that they should leave a lot of space around the plants, but I always do the opposite myself! Now I know I´m doing the right thing!! Well, you’re doing the right thing for you, at least! It’s sad to see plants all squished together, so I think it’s still fair to encourage people to give them “adequate” space at planting time. The problem is that you don’t really know what qualifies as “adequate” for your particular plants and conditions until you’ve been gardening for a while. 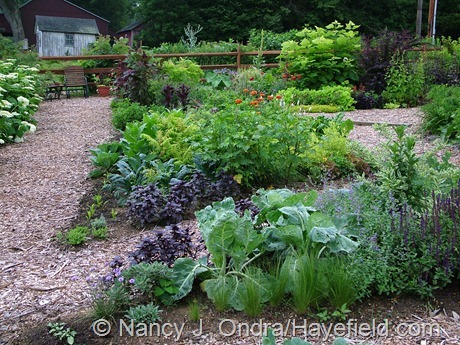 It’s hard to explain that to beginning gardeners, when they have so many other variables to consider. This was a great post. I enjoy seeing the evolution of the gardens. 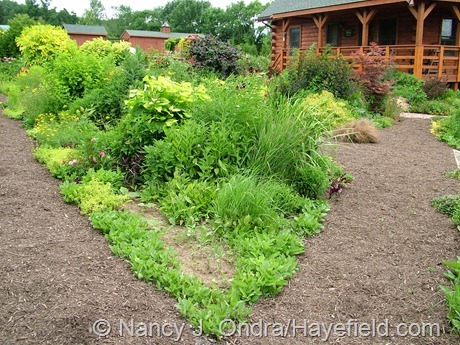 I was interested in what looked like large mulched areas defining the future beds. Was there a product used before the mulch was applied? How soon did you begin installing the first plants? I’ve used a whole lot of newspapers for garden-building over the years to smother the existing grass and weeds. 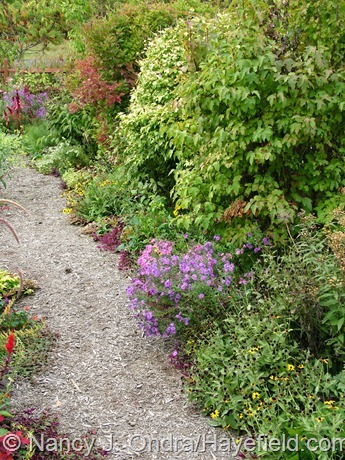 For the paths, I topped them with rough wood chips or bought-in shredded hardwood mulch. And for the beds, I topped them with whatever compost-like stuff I could find, then waited as long as I could (usually 3 to 6 months) before planting. All of your experience and advice is ringing true to my experience in Italy. But what nobody can change is the fact that great gardens aren’t made overnight – and oddly enough (just watch some TV show about garden rescue makeovers, or whatever they’re called) some terrible gardens are. Things inevitably looked “plonked in” if they are. Time – and the techniques you’ve shown through this post to have mastered – are the only cure. Gardeners who love plants and nature won’t mind waiting even years for things to look right, fill in, and find their balance. People who want perfection immediaely and constantly had better have a whopping huge budget; but even then, it won’t have the feeling or stability of a mature garden. 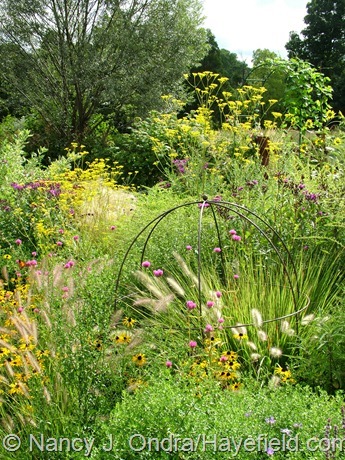 Plants have to be time-tested, and every garden is different – even every corner of each garden is different. What always amazes and delights me is that you’ve found SO MANY plants that work so well for you! 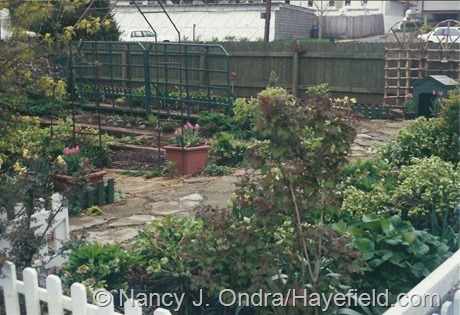 I love to see how you’ve created such a lively and diverse garden from an empty lot of land. You really have created a “personal”, “interesting” and “beautiful” garden, but I don’t mean any of those adjectives as the euphemisms you begin your post with. This, of course, is coming from a gardener who, probably like you,prefers plants over perfection and diversity over design. Thanks, Clark! Until you’ve had a chance to observe the same piece of ground over a period of years, it really is hard to appreciate that time is as important as soil preparation, plant selection, and all of that. It’s a hard thing to explain in writing, too: it needs to be seen to be appreciated. Going through the old photos was an interesting experience. Those very first gardens look pretty pathetic to me now, but at the time, I thought they were wonderful. I’m kind of glad that I didn’t know then how many times I would end up moving all of those plants around! I too like to see the evolution of gardens. I would just faint if I had this much room to plant. I admire your fortitude and the results well, they are fabulous. I love to see the differences in people’s gardens. 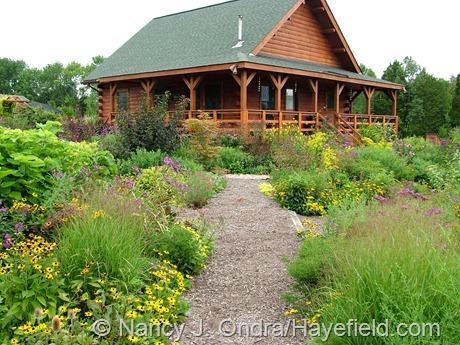 It is amazing how different each garden is, just like the people that create them. It’s a good reminder to take *lots* of pictures, isn’t it? Unfortunately, the first five years here were pre-digital-camera, but this post was an excellent excuse to spend time scanning in some prints. And I agree: looking at all that empty space makes me very tired! I don’t think I could do another garden this big. 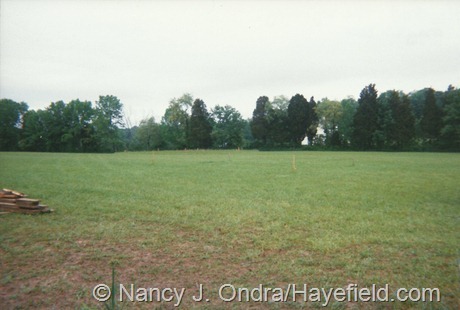 Thank you for posting such an interesting and informative article about the development of Hayefield. Not that I am planning anything on such a large scale, but I will hopefully be ready to start planting a garden in spring (our southern hemisphere spring in September) and feel a bit better mentally prepared now. I have begun the process of deciding on what to plant and had been feeling a bit daunted (I’ve done the whole perennials with gaps and associated weeding nightmare thing over the years), but now I know to fill the gaps with annuals. How exciting, Lynn! 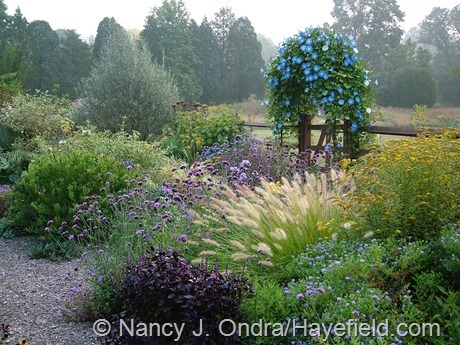 Doesn’t it seem funny that a successful perennial garden often starts with a whole lot of annuals? I think what scares many beginners is seeing that annuals can cost almost as much as perennials these days. It’s a good reason to encourage would-be gardeners to pick up seed-starting as a skill early on. Best of luck with your new garden! Great to see (hear) your personal thoughts about starting from scratch. Like you, we built our house in the middle of a meadow. Like you, I spaced plants according to instructions. The mulching was expensive, the weeding kept me from enjoying the garden. Plants died because 12 hours of full sun in the south will broil and fry. When I started seed-sowing between perennials for spring flowers, followed by seed-sown summer flowers, the maintenance was lower and survival was higher. 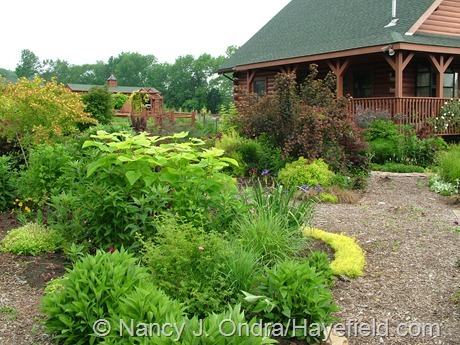 My strategy is plant it thick…then have fun thinning and transplanting. On our third day of 104+ heatwave, nary a plant is faltering this year for the first time. Masses of seed-sown rudbeckia hirta and coreopsis are shading the soil. It’s amazing what $6.00 worth of seeds can do to save a garden and make a gardener happy! We must be kindred spirits, Freda – we have found so much in common in our taste in plants and approach to gardening through our blogs. Wonderful post, and one I REALLY needed to read this week! I’ve been fretting that my garden expansion isn’t going as fast as I would like it to. This year, lots of the cool, lovely weather got devoted to keeping existing gardens at their best, although I had visions of finishing the beds on the edge of the front garden instead. I did get a new shrub and annual section planted, and your pictures remind me that it will look great once everything settles in and gets growing–plus I won’t be able to resist adding more plants. Thanks so much for sharing all the pictures. Your garden has really come so far since the field you started with, and it gives me hope and encouragement for mine! 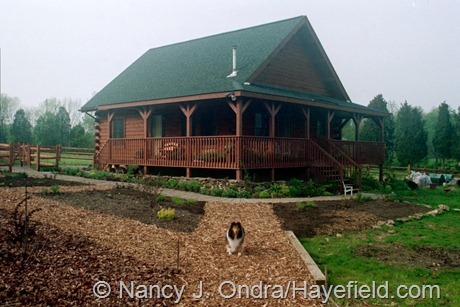 Maybe you need to dig out pictures of your old garden to lift your spirits, Barbara, or even look back at the pictures you’ve posted of Hackberry Point since you started your blog. Right now, it’s hard to remember those cool days and regular rains, isn’t it? This is most instructive. Thanks for sharing your garden. Thanks to you for reading and commenting! Wow, thanks for the great, informative post. I am a much newer, inexperienced gardener (I’ve been gardening for “only” 10 years or so), and my results are nowhere near as nice as yours, but your expert guidance really clicks for me. Your warning that you just have to learn your plants and your space is very encouraging. I get discouraged when I’m constantly having to move plants a foot or two away from where I first put them because I misjudged the spacing. I love filling in the spaces with annuals (I use mostly self-sowers because I love the lush abundant look they give — which is probably terribly “Improper” gardening). It has also happened to me that I really end up missing them in a bed that filled up with perennials, so it made me smile to see the space where you took out perennials to make room for annuals! I too love self-sowers, Sharon; if that’s improper, so be it! They add an extra element of surprise each year, and of challenge, too: we hope that they’ll return, and in the right spots, but not so vigorously that they make for a lot of extra weeding. I love seeing the progression of your plantings over the years. It inspires me to keep going. My close family always says,” Aren’t you supposed to leave the plant in the same spot once you plant it? All you do is move them around.” But they don’t see that gardening is a progressive past time. I always see in my mind’s eye how it can look better. That is what is so nice about this passion called gardening! And it is not a hobby for the faint of heart – Perform or you’re out! Thanks for the honesty! Bring it on!! Once you plant a plant, it must stay planted there forever? Oh, the heresy. It took me a while to get up the confidence to start shifting perennials around, but now it’s just a routine gardening task – when the weather conditions cooperate, at least. Thanks for visiting, Dianna! A great post. Like so many others, I come to your site for endless inspiration. What I find so fascinating is that you think of yourself as a simple gardener, not a designer or ‘pro’ selling anything. Your garden is there to please you and you alone. I love this. Of course, the great irony is that you have the design skills, the artistic eye for composition, the intuitive “gut” for plants, and the credentials of a seasoned professional. You claim not to obey design”rules,” but that is only because you have intuited them so well you can break them. You are one of the finest horticultural experimenters I know. Short of Great Dixter, few places are as innovative as Hayefield. Your garden is a gardener’s garden. But you are a real pro. Hi Thomas! Thanks so much for checking in. You have to know that I’m really not a professional designer; I don’t have formal training in design, and I only occasionally plan and plant gardens for other people. I don’t think I’m being overly modest about the plantings here. As much as I dread having garden tours, they’re very useful for keeping one humble. When people come and walk around for 5 minutes, then ask the tour leader when they can leave for the next garden, or when people walk 10 feet into the garden and then stand in one spot for the next hour, telling you about their own garden, you have to accept that you haven’t provided an experience they can relate to. I’ll agree that my place photographs very well, but I do get the sense that people who have seen it in pictures are underwhelmed when they see it in person. I’d be disappointed by that reaction, if the garden didn’t surprise and delight so much. Thanks for another great post and one many can relate to. This is really what people need to learn about gardening- the evolution. I’ve followed these methods for for years at every property I owned and on my new property in just 5 years, I have a thick lush paradise filled with trees, shrubs, perennials, bulbs and annuals not to mention marginals in pots. I show people areas that did not come out as planned and all of the mistakes I made while planning this paradise. 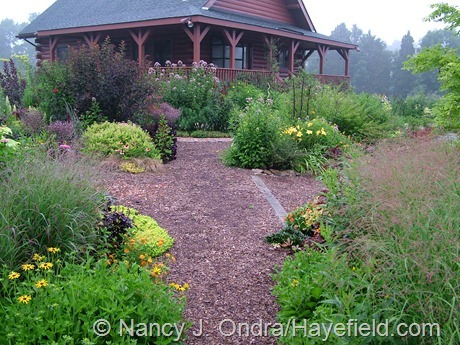 When I have garden tours at Crabtree Gardens, I’m thrilled at the fact that people like my ideas and ask the details to recreate it at their own homes. I worry that maybe my garden doesn’t compare to the highly staffed ones that many are used to visiting, but when the tours leave, I’m energized and I realize my fears were unfounded. I’ve gained so many believers and have signed up visitors for future classes because of the lushness they saw and the desire they had to attain it at their own homes. Thank you again for showing us the evolution! That sounds wonderful, Sandi – like a gardening school! 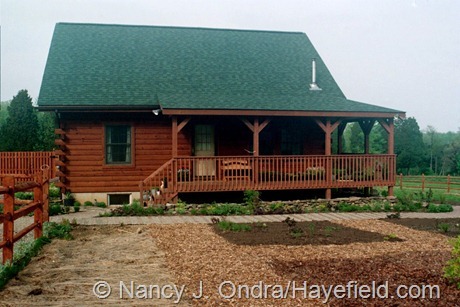 Clearly, people can relate to what you’ve created at Crabtree Gardens. Keep up the good work! Beautiful home, garden, and setting. One of my favorite posts! Are we twins separated at birth?! Thanks so much for sharing the before and after photos, and in between! Three cheers! Well, I already have one brother named Tim, but who knows? There has to be a certain bond between obsessed gardeners that’s beyond genetics, anyway. Thanks for reading, Tim! 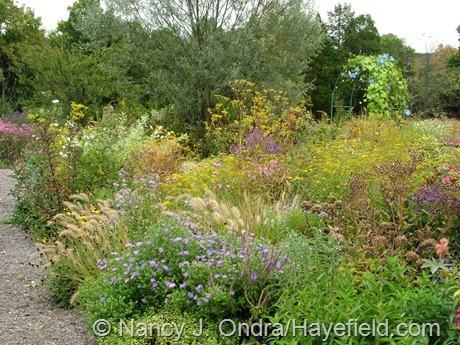 This was an excellent post about the evolution of a truly beautiful garden. 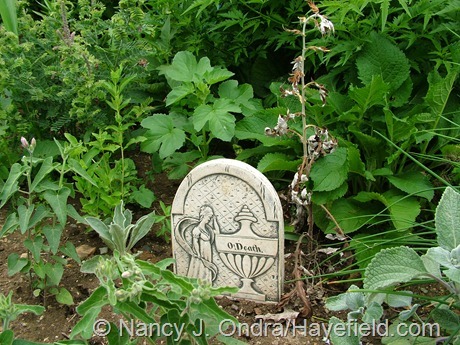 I think it’s a post that every beginning gardener should read and take to heart — especially the part at the beginning about not following the rules and planting for their own personal pleasure. Thanks, Alison. In a way, I think it can be a comfort to have rules to go by when you’re just starting out; it gives you the illusion, at least, of having a chance to do things “right.” Eventually, you figure out that “right” is relative, depending on whether you want a conventionally beautiful garden or if you’re more focused on cool plants or simply having fun. I love your design, you appear to have a natural eye for it. My favorite part about a new garden is first making a few spots where I can just sit out there, drink my tea and survey the new kingdom. I then began to plot and visualize it. For my garden, I have never sketched it out or made a design on paper, it’s all in my head. I’ve been gardening in the same spot for 15 years now, so I do miss that part of it. Anyway, thank you so much for a wonderful essay about your garden evolution! Ah, yes, Debbie; I understand what you’re saying. I filled the last unplanted area inside the fence last year, and I’m just wondering how long it’s going to take until I get the urge to start making new borders outside. I hope I can resist that and instead concentrate on taking good care of what I already have. 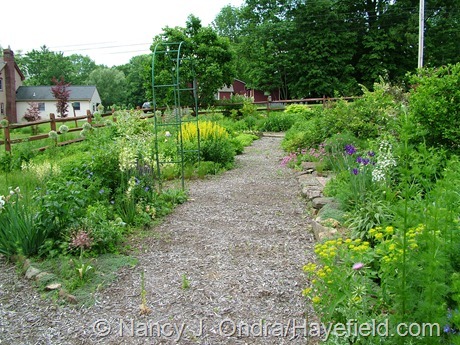 What fun to see the evolution of parts of your garden! I really enjoyed seeing how things have progressed. My own garden is very much a “work in progress” and I needed the inspiration to plant more closely and use more annuals. Some of my newer areas are a bit forlorn right now due to plants being “properly spaced”. However, I did have a nice show of opium poppies this spring that filled in the holes pretty well. A challenge for self-sowers can be a thick layer of mulch that has formed a hard, impenetrable crust… I think I will switch from wood chips to pine needle next year. Mulch is much needed in my south-facing sloped beds, especially when we hit 114 degrees F this week! And only 2 inches of rain in the past 6 weeks, or maybe 8! A very challenging year in the garden! I hope yours has been better. Thank you for a very informative article. I’m glad you have the courage to garden for yourself and not for anyone else. As you say, you are the one who has to live in it and why should you not have the joy of doing exactly as you please? I think true beauty emerges when folks can be free to be that creative in the garden. Oh, poor Kate – we’ve been hot and dry here too (less than an inch in the past month), but you have it even worse. That’s a good point about having to balance the need for mulching with the wish to have plants self-sow. Here, any mulch I can afford gets put on the paths, not the beds. Apart from a scattering of alpaca manure every year or two (the boys don’t make nearly as much as I could use), the plants have to make their own mulch. Thanks for the before-and-afters. It’s encouraging to see that others have started from a blank paddock too! I use your blog posts to inspire me to continue inproving on a particular garden area near our pond. It comprises a long flat tow path that runs alongside the creek (this long bed is 100m x 10m) plus several other large areas. The whole jolly lot was pasture 6 years ago. 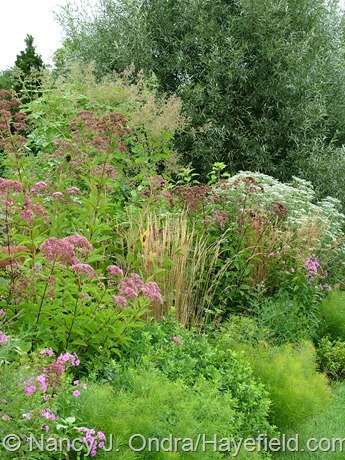 I fenced it and put in several trees, and am now developing it using mainly foliage plants in shades of black/lime/red. There are days I despair of ever having it look even remotely like yours! I see some of your garden backs onto grazing land. I’ve found this comes with inherant risks! How do you deal with stock reaching through/over and munching the plants, and what do you do to stop the pasture grass encroaching into the backside of the garden? 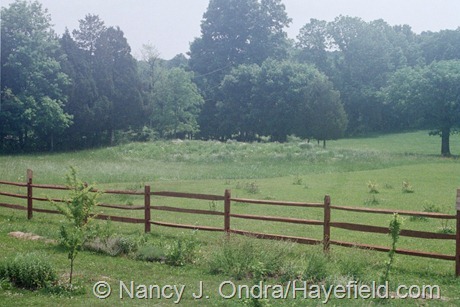 Hi Kerry – the boys’ pastures are in the center of the property, so technically, the gardens and meadow wrap around them. The problems are the same, though. I’ve tried various barriers to protect the plants, but they just seemed to make Daniel more determined to get around them. (Duncan rarely reaches through the fence, and Daniel now mostly does it only if I’m nearby to yell at him repeatedly and then go find some sort of treat to distract him. He has me very well trained.) 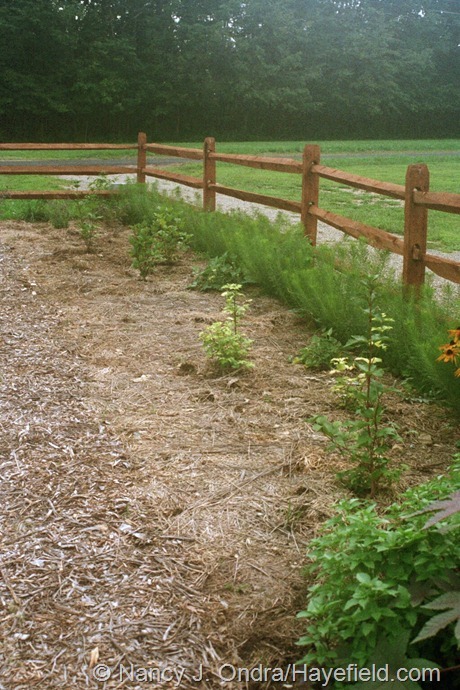 In some places, I leave a 2- to 3-foot-wide mulched path between the fence and the plantings; that also helps to provide a control zone for creeping pasture grasses and weeds. Elsewhere, I plant sturdy ornamental grasses (mostly Panicum species) along the fence; they’re safe for the animals to eat, and they recover easily from light grazing. One of the best horticultural “This I Believe” pieces I’ve read. Thanks, Nan. Oh my, thank *you*, Denise! Thank you so much for this inspiring post. It’s one of my favorites so far!! Thank you for sharing what you’ve learned, what has worked, and what hasn’t. It’s helpful to me to know that I am on the right track, so far. My new small back garden has received just a few of it’s shrubs this year, and the rest are annual ornamentals/edibles. I’ve come to peace with the fact that a garden is never finished…. “Never finished” is a good thing, Katie. When I looked at my last garden and realized that it was pretty much done — that I’d filled all of the available space and couldn’t think of anything else to do there — I ended up selling that place. I wish you a long and rewarding time creating your own happy place. What a wonderful, insightful post, Nan! It’s always so reassuring to see these sort of transformations…both in the garden itself…and in how we think about our gardens. I have to admit, when younger, I couldn’t care less about the plants I love now…I only wanted things that were exotic and as tropical-looking as possible. 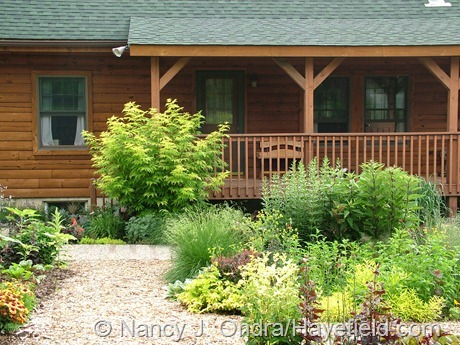 Strangely, over the years, I did a complete 180…and now adore those plants that surrounded me while I was growing up! Plant spacing i something I always struggle with…perhaps someday I’ll figure it out ;-) I’m perpetually amazed at your skill at combining plants…I know of so few people who can combine plants in a way that each of them not only looks good in contrast with their companions…but somehow that contrast enhances what makes each plant unique. Hey there, Scott. You have your own gift when it comes to combining plants, you know. How funny that you and I had a similar progression in interests from rarities to familiar favorites. It makes much more sense to get more specialized over time. Well, either way, it’s the changes that keep things interesting! I’ve always liked the description of gardening as “the world’s slowest performing art,” PG. Your comment raised another interesting point: “beautiful” home gardens — those with classic features that appeal to a wide range of people — often survive the transfer to a new owner, at least for a while, but “personal” gardens tend to disappear quickly, either from neglect or from being replaced by lawn. I was sad to see that my precious little garden in Emmaus was back to all grass within a few years after I sold it, and I wished I had taken more of it with me when I moved. I would have had such a hard time not taking that personally Nan. I can’t bear the thought of it! If we move, I’ll be sure and heed your warning. I don’t have anything that rare or fancy, just one or two dozen old reliable friends. Great post! Hi Nancy! My comment has absolutely nothing to do with the topic of this post, but I could not find a way to post a comment at the specific blog. I just stumbled upon your blog of “Three Neat Plants” and one being Gomphrena “Fireworks”. I grow, from seed, many of the tall Gomphrenas and do grow G. “Fireworks”. I am a garden designer in South New Jersey. Regarding your comment of G. “Fireworks being more of a see through plant such as V. bonariensis may I offer you a tip? G. “Fireworks” really should be quite dense and full so the trick is pinch several times while the plants are young and you will have quite a thick actually bush like plant. Very magnificent. You may have realized this by now. I enjoy your website and your many fabulous comments. One thing I have now found is the black foliaged cotton, Gossypium herbaceum ‘Nigrum’ which was brought to my attention by one of your photos and comments. I did not think I would find it, and was not even looking for it, but just by a fluke about a month ago I found it in a lovely nursery in Delaware and it is on the move. I’m hoping I’ll be able to save seeds and grow it for next year. Have a great season!! Keep drinking lots of water and be careful in this oppressive heat. Hope your boys are holding up in this heat. Thanks for visiting, Ruby, and for the tip about ‘Fireworks’. I actually prefer its natural form; it’s easy to find dense, bushy annuals, but those that want to be somewhat taller and looser blend more easily with perennials, I think. It’s great that you were able to find the black cotton as a plant! Landcraft Environments in New York grows it wholesale, so you can sometimes find it in our area from retailers who buy from them. Barring a freakishly early frost, I have a feeling we shouldn’t have any trouble getting seed from our cottons this year! This post just might be my all time favorite! Hey there, Kathy! Thanks so much for visiting and commenting. I hope all is going well with your garden this year! 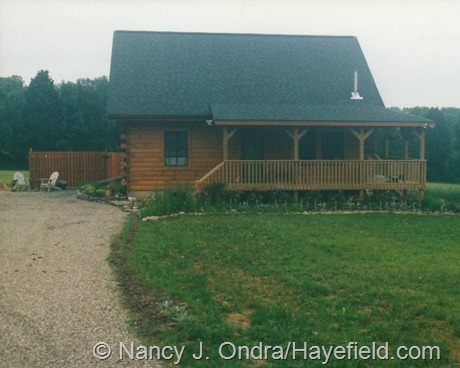 Nan, did you realize I live in a log house too? I just noticed you do. I guess I always look at the pretty photos of your garden without thinking about the house. I think we all pretty much agree your taste is exceptional. Your plant combos make me swoon for instance. I’m not buttering you up when I write this. 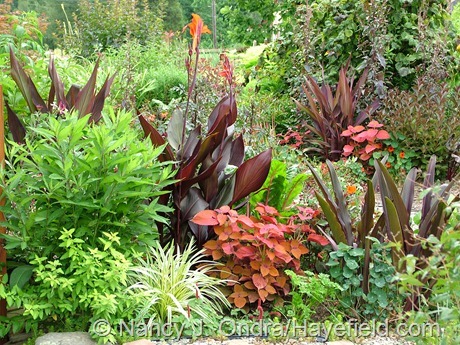 I also love the dark grasses and red-leaved cannas. My garden style has changed a lot too. I was also thinking of you the other day when I found another rose with Rose Rosette Disease. This now makes six or something. When I first found it in my garden, people didn’t know what it was. Now, it’s spread all over my state and beyond. I get questions about it all the time. Anyway, I was thinking about how I may eventually lose them, and suddenly, I didn’t care. There are many other flowers worthy of the space. That’s so cool, Dee – we obviously have a lot in common, even though we live so far apart and probably won’t ever get to meet in person. Yeah, I feel the same way about the Rose Rosette; there are plenty of other things to grow. A beautiful Rosa glauca was the latest victim here. So far, none of the Knock Out roses are affected, so they’re pretty much the only ones I have left. I’m really looking forward to our seed trades this fall. Mom is very excited about the zucchini you offered! Oh, I really enjoyed this post. I have moved to a wonderful old house with “cookie-cutter” foundation plantings and not much else. It is very encouraging to see the progression of your garden’s development; it gives me hope! Just last week I planted several shrublings “spaced correctly” and I am looking forward to planting around them, knowing many will be relocated later on. I was able to move the eranthis you sent from my former garden and I’ll be thinking of you when they bloom next mud season. Hi Kathy! Wonderful to hear from you. I know how busy you are with your new place. Sounds like you are off to a great start, though. The colchicums you shared with me have settled in beautifully, and I look forward to seeing them reappear in the next month or so. Firstly, I LOVE your site and am so happy you take the time to share. Secondly, I am happy to discover that my problem of planting perennials and then impatiently waiting for them to fill in is not something I have to suffer with much longer. We’ve eliminated about 900 square feet of turf in our front yard, and I’ve been in agony over what the next three years will look like while it all fills in – you’ve provided the answer. Third, thank you for giving permission to “break the rules,” that’s just what I needed. Hi Camille! 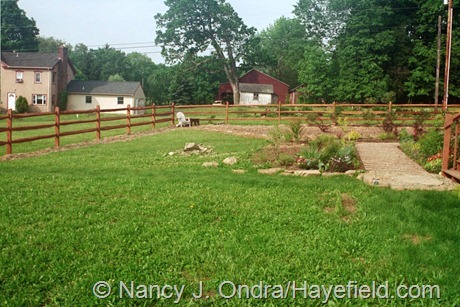 Your new garden sounds so exciting – what a labor of love you’ve undertaken. If anything I’ve said makes your project a little easier, I’m thrilled. Best of luck to you – and remember to take lots of pictures! I’m so pleased to have stumbled upon your blog. Your trove of great info, insights, & top-notch photos make your entire list of past posts at the head of my “Must-read” list. 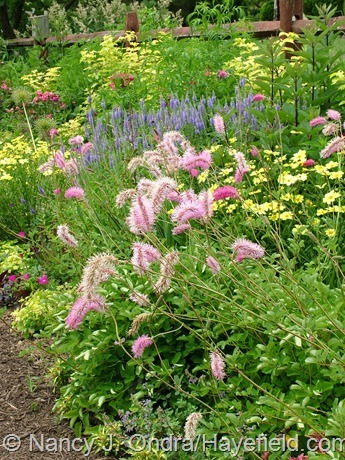 You’ve done a fine job of demonstrating the evolution of some richly planted borders. Indeed, it’s that evolution that makes the garden exciting and continually filled with new challenges…..hopefully improving each season but admittedly, not always. I’m intrigued to hear that you feel your garden may photograph more impressively than it appears in person. It seems that more often, the opposite is true. But judging from your photos, it’s clear you are making magic happen…..even if not at all angles, all the time. 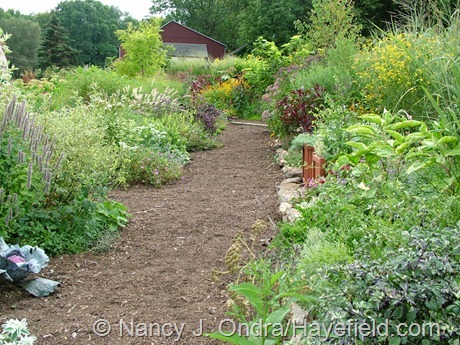 Here’s another strategy for taking on a brand new garden your readers might want to consider: When there’s not enough time or $$$, it may be worth tackling only portions of the bed/border you eventually expect to cultivate. Depending on the size and character of the property you are gardening, this can be a more satisfying system. 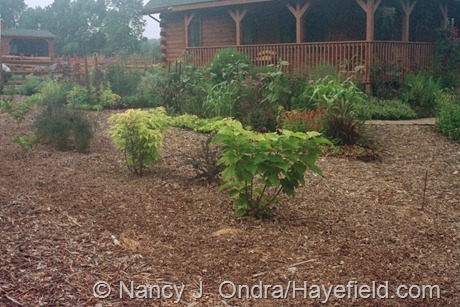 Your newly planted zones may be more densely planted on a limited budget, and may not require large areas to mulch or to try to fill with annual fillers. And of course, it’ wise to scour your property to see if there aren’t established perennial plantings & groundcovers which can be divided and used to fill empty zones. Excellent advice, Eric; thanks for sharing it. I should have also mentioned that learning how to propagate plants is an important skill for anyone who has a lot of space to fill. Your comment “hopefully improving each season but admittedly, not always” particularly resonated with me; when I was choosing photos to show the evolution of the different areas, I realized that some of them haven’t looked quite as good in the last year or two and need some tweaking.